Parties and festive meals offer a smorgasbord of options for putting on pounds during the lengthy holiday season. With so many tempting choices, it’s easy to over-indulge. But knowledge is power, so here are some tips for defending yourself from holiday weight gain. When things get busy, often the first thing to be jettisoned is working out. But exercise helps you cope with additional stress — and helps burn off extra calories from those inevitable treats. Make the time. Exercising with a friend is always more fun, so instead of spending hours stirring up holiday goodies in the kitchen, use that time to invite a friend to take a walk — outdoors, if the weather permits, or indoors at a mall if it’s too cold. Then indulge in a pedicure instead of that plate of fudge you were planning to make. It’s tempting to take up residence by the buffet at holiday parties, but resist the urge to stand and nibble. If you’re going through a buffet line, use a small plate to help keep portions limited and then move away from the food while chatting with your friends. Do keep something in your hand, though, so the host won’t tempt you with more treats. Here are a few more suggestions for creating a healthy holiday party of your own. Instead of… obscuring the taste of canned beans with a medley of high-fat, high-salt creamy soup and fried onions, splurge on fresh beans, cook until just tender and add interest with a garnish of fresh dill, sliced shallots and diced red pepper. Instead of… pecan pie, share a platter of candied pecans, sliced fruit and pungent cheese (pictured) to end the meal on a festive note. No doubt about it, pecan pie is an indulgence. Another options is to just eat the pie filling, but not the crust, cutting out about 60 percent of the calories. Instead of… a platter of cookies, choose or bake small ones and mix them on a pretty serving dish with fresh fruit (pictured). And red grapes and apples or pears can make a holiday table look truly festive. Here’s another tip to avoid cookie temptation: If you are invited to a cookie exchange, bake a recipe that you don’t really like to eat. Seal the cookies in plastic bags and don’t open them until you get to the party. Instead of… pecan pie, share a platter of candied pecans, sliced fruit and pungent cheese to end the meal on a festive note. No doubt about it, pecan pie is an indulgence. Another option is to just eat the pie filling, but not the crust, cutting out about 60 percent of the calories. Instead of… a platter of cookies, choose or bake small ones and mix them on a pretty serving dish with fresh fruit. And red grapes and apples or pears can make a holiday table look truly festive. Here’s another tip to avoid cookie temptation: If you are invited to a cookie exchange, bake a recipe that you don’t really like to eat. Seal the cookies in plastic bags and don’t open them until you get to the party. 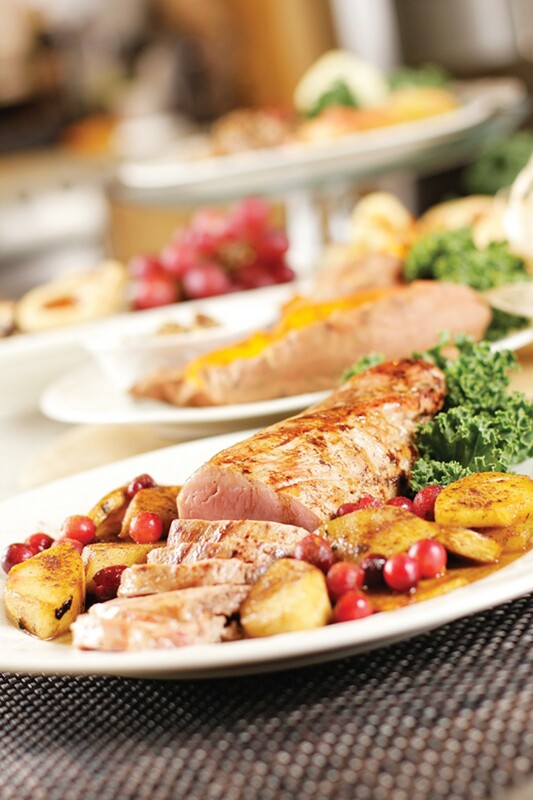 Instead of… prime rib, serve a roasted pork tenderloin (see recipe on facing page). The traditional prime-rib dinner packs a wallop in fat and calories; eight ounces of prime rib checks in at more than 500 calories and nearly 45 grams of fat. Pork tenderloin is nice and lean, and you can punch up the flavor with herbs and seasonal fruits and veggies.